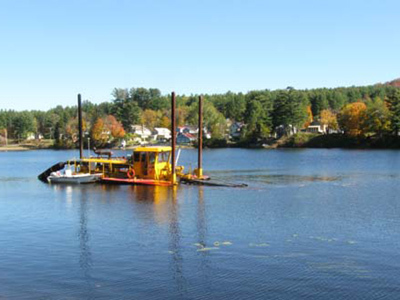 EcoLogic began working with the Town of Wells in 1999 to investigate the feasibility of dredging to restore recreational usage of Lake Algonquin, a small impoundment on the Sacandaga River in the Adirondack Park. We completed detailed surveys of the littoral and shoreline zone to identify critical habitats for protection, and reviewed existing data and queried databases for the presence of rare, threatened and endangered species. Permits were required from the Adirondack Park Agency (APA), the US Army Corps of Engineers, and the NYS Department of Environmental Conservation. During the dredging period, which began in August 2006, EcoLogic performed environmental monitoring required as part of the APA’s dredging permit conditions. We observed dredging and waste disposal operations, and verified the presence or absence of four terrestrial invasive species in upland areas impacted by the dredging activities. Invasive species monitoring followed procedures outlined in the Invasive Species Management Plan (ISMP) developed by EcoLogic and modeled on the Adirondack Park Invasive Plant Program (APIPP). To reduce the chance of introducing invasive species into the area, the dredging equipment was thoroughly pressure-washed with hot clean water prior to arriving at the site. EcoLogic conducted monthly inspections of upland areas to identify whether the four terrestrial species were present; macrophyte surveys were conducted annually to identify whether the two aquatic species were present. EcoLogic also carried out streambank restoration along a segment of Elbow Creek as required by the US Army Corps of Engineers dredging permit. For this restoration, the area was re-graded, the soil was amended, and the area was replanted with native riparian vegetation to stabilize the soils.